Atukulu dosa or Aapam is Sponge dosa is the way we call from the childhood. Yah its really very spongy simply melts in your mouth. You can call either way, Dosa or Appam. You can make it thin or thick as you wish. This is wonderful breakfast or dinner menu. And any spicy chutney, coconut chutney everything goes very well with this. I often do Vada Curry with this Dosa . Vada Curry is very popular dish in Tamil Nadu. You will find this in almost all the hotel which is served with Idiyappam, Set dosas.. It extremely tastes wonderful and its best accompaniment for Idli, Dosa, Aappam, Idiyappam(string hoppers)and Set dosa. The history of this vada curry is they say that they started making this from the leftover vadas. Now it has become popular menu all over Tamil Nadu. 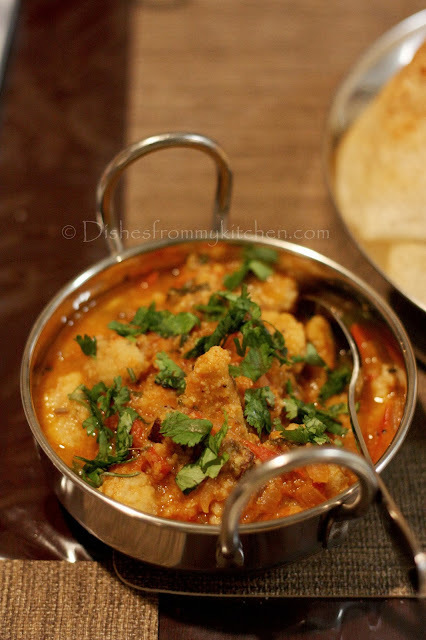 If you never tried making this vada curry before, I suggest to try atleast once. I bet you will make it again and again. 1. Soak rice and poha together and urad dhal seperately for few hours. 2. Grind the urad dhal first as you do for idli. And then grind the rice and atukul to fine batter. 3. While grinding itself add the curd. 4. Now add the salt and mix dhal and rice batter very well. 5. Ferment it over night. 6.In the morning or when ever you want, Just heat the skillet, pour laddle full of batter as thick or thin as you prefer add 1/4 tsp of oil and close with the lid. 7. Once it is cooked in the bottom and you will notice the color change in the top as it is cooked. 8. Do not flip it, as it is not need for this. Just serve with your favorite accompaniment. 1. You can make even idli , comes out so soft and fluffy. 2. You can make paniyaram by adding chopped onion, season with mustard, coriander leaves, green chilli paste, curry leaves. 3. Even you can make dosas after adding all the onion, seasoning and leaves. But this has to be flipped and roasted tastes awesome. 1. Soak three dhals for few hours and grind it like vada batter , that is slightly coarse. 2. Now heat oil in the wok or kadai. Drop the batter to small balls. And deep fry till slightly golden brown. 3. While we do this... we have to make kurma in which we are going to add these vadas. 1. Grind the first nine ingredients to coarse paste as we do for kurma. 2.Heat oil in the kadai, saute the onion to slight brown color. 3. Now add the curry leaves and tomato. Saute till the tomato is mushy. 4. Now add the ground paste and add water 3 times. Cook till raw aroma disappears. 5.Now the gravy starts to thicken. Add the vadas that you made and garnish with coriander leaves. 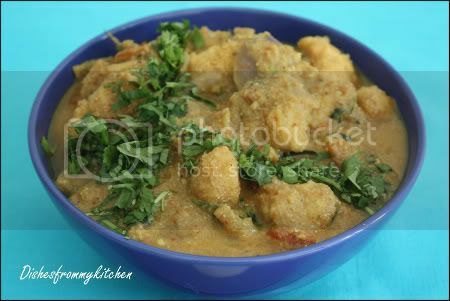 Yummy VADA KURMA is now ready to serve !!!!!!!!!! 1. 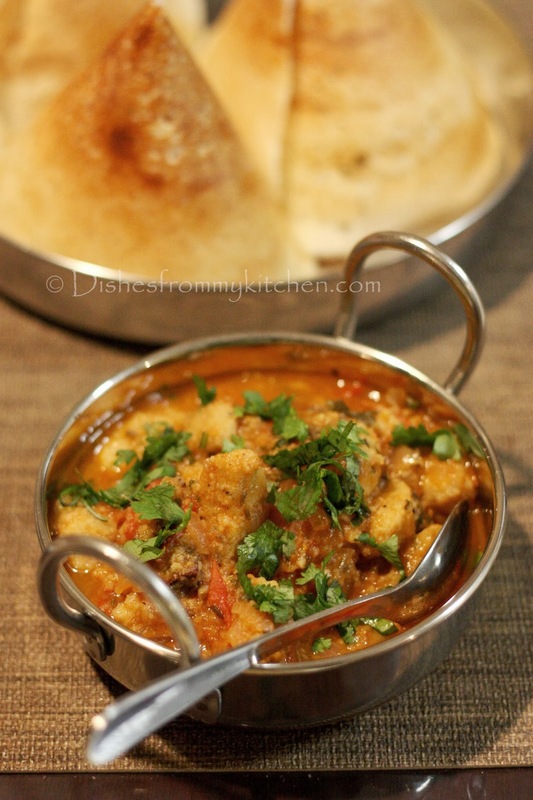 If you make big vada just make to small pieces and add to the curry. 2. I love to have small balls in the curry. 3. This tastes wonderful even the next day. 1. Soak the dhal in water for 1 hr then coarsely grind with other ingredients and ferment overnight(Fermenting is absolutely optional). 2.Make small balls and steam it for 15 minutes. 4. Once steamed make to proper balls and add it to the curry. 1. Make small balls and steam it for 15 minutes. Make proper balls before they cool. 1. My version is using all the above dhals, you can also use Channa dhal alone with some salt and red chillies and steam or deep fry them for the curry. Either way it tastes delicious. 1. Prepare the vadas either by deep frying or steaming and keep it ready. 2. Heat oil in the pan, add the whole spices followed by the ginger and garlic paste, saute till raw aroma disappers. 3. Add onion and curry leaves, saute till they are light brown in color followed by the tomato. 4. Now add the green chilli, coriander powder ,chilli powder and mint leaves. 5. Saute until oil seperates. Now add 1 1/2 cups of water let it come to nice boil. 6. Now add the fried or steamed vadas and let it cook until half of the water is evaporated, you can also break the vadas roughly to make the gravy little thick. 7. Check for the salt and switch of the flame. Garnish with freshly chopped coriander. 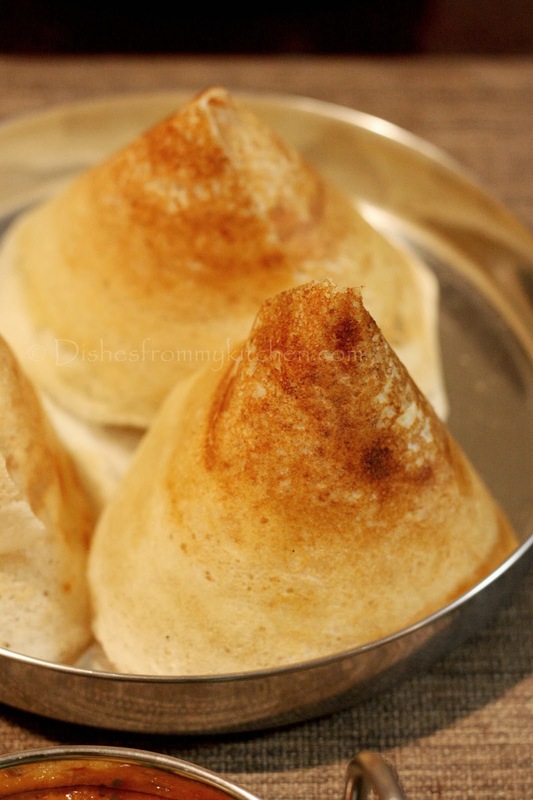 Serve hot with Idli, Dosa, Aapam ... its very yummy and I am sure you will eat extra dosa or appam with this delicious sidedish. 1. Both for vada curry and vada kurma you can use any leftover masala vada. 2. You can use any vadas and make kurma or curry. 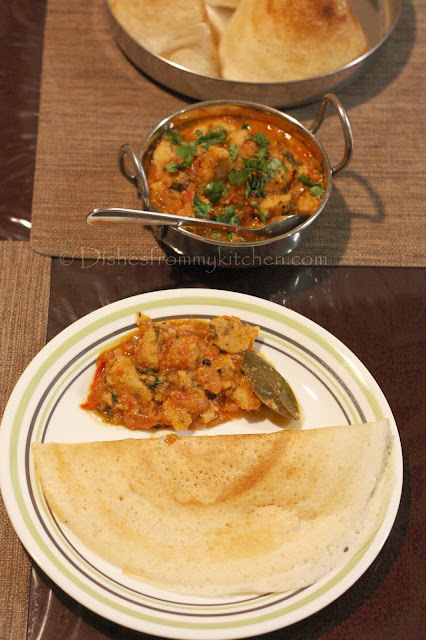 Both curry and dosa sound and look very yummy...esp. the dosa! Lovely recipe cute presentation . Both the curry and dosa looks yumm!!! a very cute presentation! Dosa and curry looks delicious!! Dosa looks great. Certainly looks like a sponge to sop up the side dish. Lovely the tick-tock presentation dear! Looks soft & crisp at the bottom.Love the presentation.Vada curry is my fav. Looks so soft and spongy... love atukula dosa... perfect dip with vada curry.... lovely combo Pavithra and beautfiul presentation. 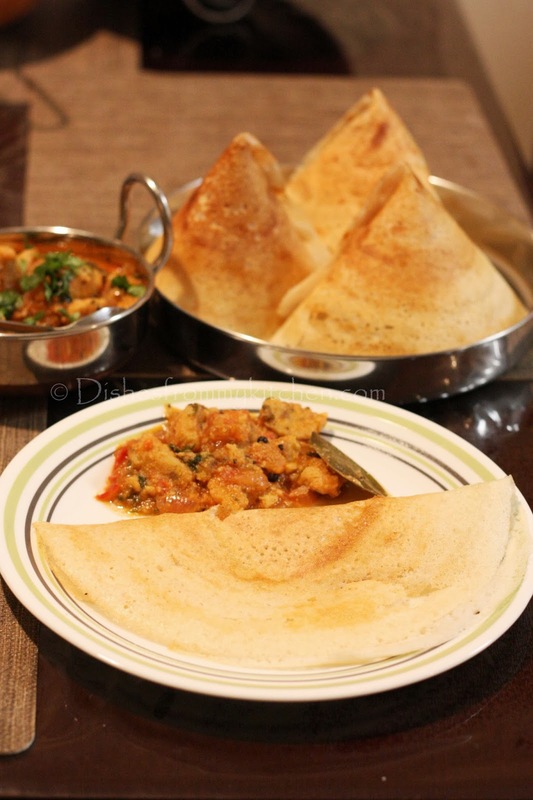 The atukkulu Dosa looks very soft and reminds me of how we used to wait next to Mom while she makes and never give her enough time to make an extra while we demand for more ;) Its a perfect combo, slurrp slurrp!!! Happy to see you too love vada curry. Like that dosa also very much.Superb combo. Very nice presentation dear. Looks yummy :) are the hands of the clock done with capsicum???? 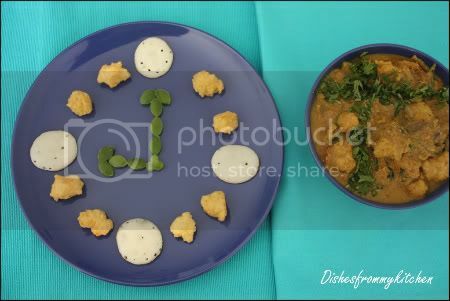 both the dishes look delicious..i have heard of vada curry..never tasted it..bookmarking the recipes..
such a cute food clock,just love your creativity and both the dishes looks so delicious and lovely combo too..
Looks so soft.i too make this..Never tried with vada curry combo..will try out soon..
perfect dosa with perfect vada curry...looks yummy! Dosa and vada curry great combo dear.. Looks delicious..
nice combo with cute pictures.the new background is so nice. dosas look so cute and soft. 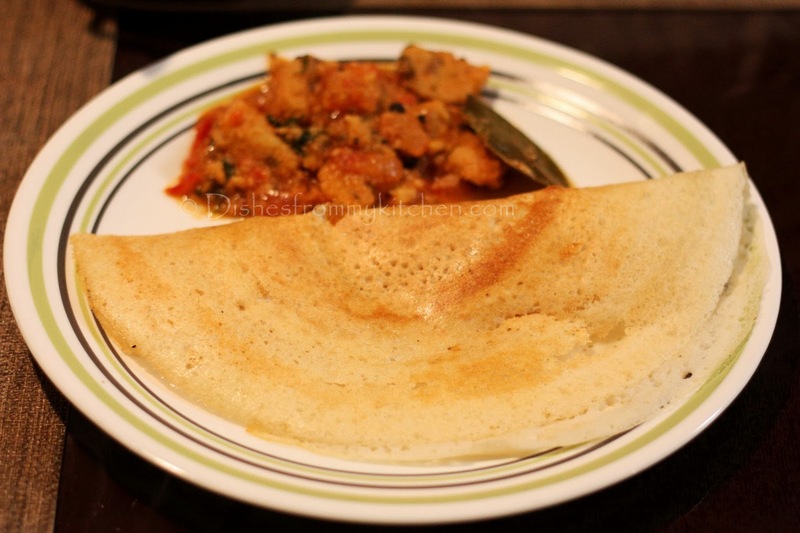 Spongy dosa with vadacurry...yummyy i want both dosa and curry rite now..
wow...wonderful presentation and lovely clicks,inviting dishes..makes me drool da...btw ,An award is waiting in my blog dear.congrats Buddy. 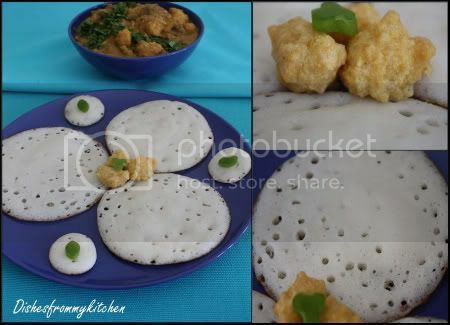 the appam and the vada curry looks so delicious..yummy clicks. Wowo apom looks so so soft and yummy. both of them look delicious!! Appam & vada curry looks delicious...lovely presentation as always :). this dosa is new to me...gr8 combo. It looks delcious - great presentation. nice presentation.same appam today night's menu in my house .thanks for sharing. Thanks for visiting my blog and leaving ur sweet comments..I have visited ur blog before and I m ur follower too but with a toddler at home i dont get enough time to visit the blogs Im following..Will definitely try to catch up regularly from now on..
the picture is so tempting....love the dosa 'n vada curry! 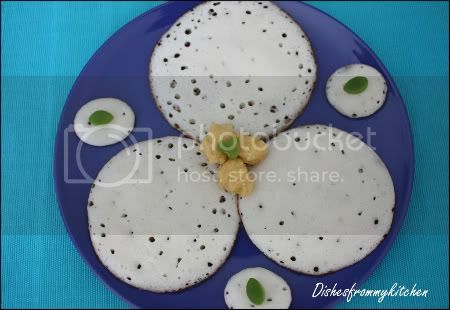 Your appam looks so delicious and presentation is awesome. No wonder you got so many beautiful comments. 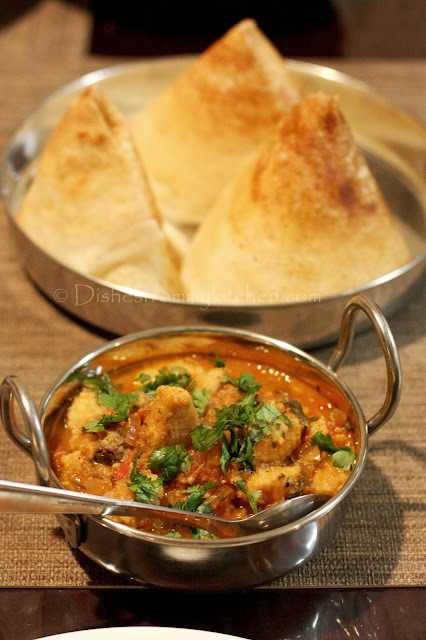 Pavithra, this looks so delicious! I love the recipes.. but more than that I just love the creativity in your presentation! very well done. first time here.. loved the dosa Pavithra.. really sponge.. 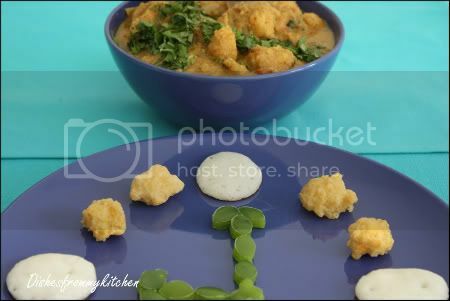 I was looking for a good vada curry recipe - I've actually never had this much growing up - just had it a couple of times but can't remember the flavor. I will be trying this soon - thanks Pavithra!! Gorgeous dosa and the vada curry looks amazing. I love the clock. Your new look is awesome too! Those looks so cute and my god, wonderful! I linked your post in my blog.